Exemestane – Steroid inhibitor of aromatase III generation, similar in structure to androstenedione. Crystalline powder from white to white with a yellowish hue of color. It is soluble in N, N-dimethylformamide, soluble in methanol, practically insoluble in water. 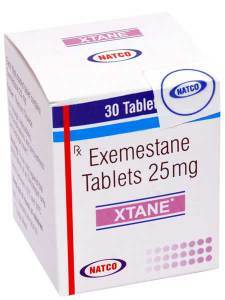 You can order Exemestane 25mg, using contact form of our website, we supply generic version of Aromasin, under brand name XTANE, made by trust manufacturer Natco. Pharmacological action – antitumor, antiestrogenic. Inhibits aromatase (irreversibly binds to the active center of the enzyme and causes its inactivation) and blocks the formation of estrogens. Has antiestrogenic effect, does not possess progestogen and estrogenic activity, does not affect the synthesis of cortisol and aldosterone in the adrenal glands. In high doses, it exhibits a slight androgenic activity (due to the 17-hydroxy derivative). Increases the level of LH and FSH on the principle of feedback: a decrease in the concentration of estrogen stimulates the secretion of gonadotropins in the pituitary gland. Causes a dose-dependent decrease in the content of estrone, estradiol and estrone sulfate. The decrease in the serum estrogen concentration in postmenopausal women appears at a dose of 5 mg and reaches a maximum (a decrease of more than 90%) at a dose of 10-25 mg (the maximum decrease in estrogen levels occurs within 3 days). In postmenopausal women with breast cancer, when taking exemestane in a dose of 25 mg / day, the overall level of aromatase was reduced by 98%. In a multicenter, randomized, double-blind, phase III clinical trial, the high efficacy and safety of exemestane in the treatment of postmenopausal women with progressive metastatic breast cancer in whom prior therapy with tamoxifen was ineffective. After oral intake quickly absorbed (the food improves absorption, the plasma level achieved in this case is 40% higher than when taken on an empty stomach). With a single application of 25 mg after meals C_max (18 ng / ml) is achieved within 2 hours. Binding to plasma proteins is 90% and does not depend on the total concentration. Well distributed in tissues. Metabolized by oxidation of the methylene group at position 6 with the participation of the CYP3A4 isoenzyme and / or by reduction of the 17-keto group with the participation of aldoketoreductases with the formation of inactive or inactive metabolites. T_1 / 2 – 24 h. It is excreted in the urine (less than 1% unchanged) and with feces approximately in equal parts within 1 week. Application: Breast cancer in postmenopausal women (natural or induced), progressing with anti-estrogens, non-steroid aromatase inhibitors or progestins. Application in pregnancy and lactation: Contraindicated in pregnancy. At the time of treatment should stop breastfeeding. Side effects: From the nervous system and sensory organs: fatigue, dizziness, headache, insomnia, depression. On the part of the intestinal tract: nausea, anorexia, constipation or dyspepsia, abdominal pain, increased activity of hepatic transaminases (mainly in patients with metastases to the liver and bones, in the presence of other liver damage). Other: hot flushes, sweating, alopecia, peripheral edema (feet and shins), thrombopenia and leukopenia, lymphopenia. Interaction: Estrogen-containing drugs neutralize the effect. CYP3A4 inducers can reduce the concentration in the plasma. Overdose: Treatment: symptomatic (no specific antidote), regular monitoring of vital functions and careful monitoring. Dosing and Administration: Inside, after a meal, 25 mg once a day. The treatment is continued until the tumor progresses again. Precautions: Do not prescribe women with premenopausal endocrine status (efficacy and safety of the drug in this group of patients has not been studied). In patients with hepatic or renal failure, dose adjustment is not required. It is not recommended for use in children. During treatment, one should refrain from occupations that require concentration and speed of psychomotor reactions (when the drug was used, symptoms such as drowsiness, asthenia, and dizziness were noted).